Henry, by the grace of God, King of England, Lord of Ireland, etc., to all his archbishops, bishops, abbots, earls, barons, justices, sheriffs, reeves, ministers, etc., and to all his faithful people, greeting. Know that to the honour of God, the exaltation of Holy Church, and the amendment of our kingdom, by advice of Gualo, cardinal priest of St. Martin's, Legate of the Apostolic See, Peter, bishop of Winchester [and ten other bishops], William the Marshall, earl of Pembroke [and other earls and nobles], Hubert de Burgh, our justiciar, and others. Firstly, we have granted to God, and by his present charter confirmed for us and our heirs for ever, that the Irish Chirch shall be free, and have all her rights entire and her liberties inviolable. We have also granted to all free men of our kingdom, for us and our heirs for ever, all the liberties underwritten, to have and to hold to them and their heirs of us and our heirs. If any earl, baron or other holding of us in chief by knightservice die, and at the time of his death his heir is of full age and owes relief, he shall have his heritage by the old relief, viz. A hundred pounds for the whole barony of an earl, a hundred pounds for the whole barony of a baron, and a hundred shillings at most for the whole knight's fee of a knight; and he who owes less shall give less, according to the ancient custom of fees. But if the heir of any such be under age, his lord shall not have wardship of him before he take homage of him, and when he comes to age, that is to say twenty-one years, he shall have his heritage without relief or fine; provided that, if while under age he becomes a knight, nevertheless his land shall remain in the wardship of his lord up to that time. The guardian of such an heir under age shall not take of his land aught save rightful issues, customs and services, and these without destruction of men [tenants] or goods. And if we commit the custody of such land to the sheriff or any other and he make destruction or waste of what is in his custody, we shall take amends of him, and commit the land to two lawful,and discreet men of that fee, who shall answer for the issues to us or to him to whom we assign them. And if we give or sell to anyone the custody of such land and he make destruction or waste thereof, he shall lose the custody, and it shall be committed to two lawful men of that fee, who shall likewise answer to us thereof, as aforesaid. The guardian as long as he has custody, shall keep up the houses, parks, ponds, mills, etc. pertaining to that land out of the issues thereof, and restore to the heir when he shall have come of age, all his land stocked with ploughs etc. as fully as he received them. And similarly with the custody of vacant archbishops, bishoprics, abbeys, priories, churches and ecclestiastical dignities, save that such custodies ought not be sold. Heirs shall be married without disparagement. A widow, immediately on her husband's death, shall have her marriage portion and inheritance; nor shall she give anything for her dower, marriage portion, or inheritance which she and her husband held at his death. No widow shall be compelled to marry again as long as she wishes to live unmarried, provided that she give security not to marry without our assent, if she hold to us, or her lord's assent, if she hold to another. The city of Dublin shall have all its ancient liberties and free customs. We further will and grant that all other cities, towns, boroughs and ports shall have their liberties and free customs. No one shall be distrained to do more service for a knight's fee or any other freehold than is due therefrom. Common pleas shall not follow our court but shall be held in some certain place. Assises of Novel Disseisin, Mort D'Ancestor and Darrein Presentment shall not be taken save in our own counties, and in this way. We, or if we are out of the realm, our Chief Justiciar, shall send two justices through each county four times in the year, who, with four knights of every county elected by the county, [court] on that day shall remain, by whom it may be competent to make judgements, according as the business shall be more or less. No freeman shall be amerced for a small fault, but according to the measure of the fault, and for a great fault according to the magnitude of the fault, saving his tenement; and a merchant in the same way, saving his warnage, if he fall into our mercy. And none of the said amercements shall be assessed but by the oath of good and lawful men of the venue. Earls and barons shall not be amerced except by their peers, and according to the measure of their fault. No clerk shall be amerced except as aforesaid, and not according to the quantity of his ecclesiastical benefice. No town nor individual shall be distrained to make bridges over rivers, except those who from of old and of right ought to make them. No sheriff, constable, coroners, or other bailiffs shall hold pleas of our crown. We shall not hold the lands of those who shall be convicted of felony, save for a year and a day, and then the lands shall be restored to the lords of the fees. Also all weirs shall henceforth be put down through the whole of the Anna Liffey and all Ireland, except by the sea coast. The writ which is called 'precipe' from henceforth not be granted to anyone of any tenement whereby a freeman may lose his court. There shall be one measure of wine throughout our entire kingdom, and one measure of ale, and one measure of corn, that is to say, the quarter of Dublin; and one breadth of dyed cloth, russets and habergets, that is to say, two ells within the lists. Nothing shall henceforth be given for the writ of inquisition of life or limbs, but it shall be freely granted and not denied. No freeman shall be taken or imprisoned or disseised or outlawed or exiled, or in any otherwise destroyed; nor will we pass upon him nor send upon him but by the lawful judgement of his peers or by the law of the land. We will sell to no man, we will deny to no man, or delay, right or justice. All merchants, unless they were before publicly prohibited, shall have safe and secure [conduct] to depart from Ireland, and come into Ireland, and to tarry in and go through Ireland, as well by land as by water, to buy and sell, without all the evil extortions, by the old and rightful customs, except in time of war. All men who have founded abbeys, for which they have charters of the Kings of England or ancient tenure, shall have the custody of them when they become vacant, as they ought to have, and as is above declared. All forests which were afforested in the time of King John, our father; shall be immediately disafforested; and so let it be done in the case of rivers which were placed in defence by the said John in his time. All those customs and liberties, aforesaid, which we have granted to be held in our kingdom, as far as to us appertains towards our men, everyone in our realm, as well clergy as laymen, shall observe, as far as appertains to them, towards other men. Given by the hands of the aforesaid Legate and Marshall at Bristol, the twelfth day of November, in the first year of our reign . [The full text of this document and translation is given in Berry, 'Early Statutes of Ireland (pp. 5-19). 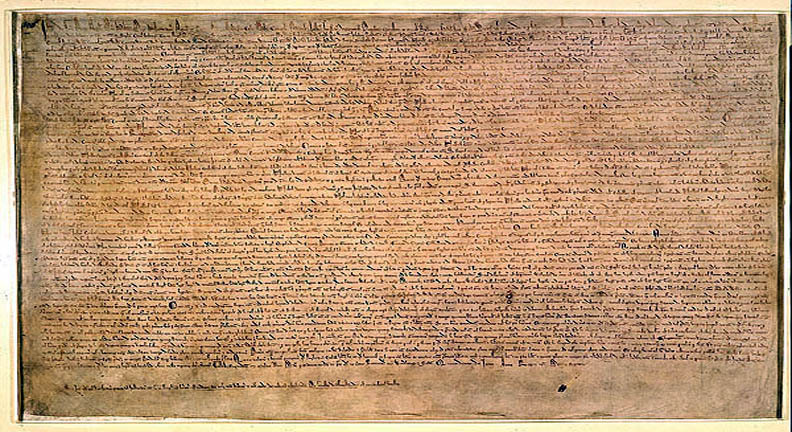 It represents the Magna Carta as granted by Henry III, on 12 November 1216, with some changes applicable to Ireland. The Charter of 1216 was a re-issue in modified terms of John's original 'Great Charter of Liberties' (granted on 19 June, 1215), now confirmed by his infant son as a royal concession and sealed with the seals of the Papal Legate and William the Marshall, the Regent. This (the first re-issue) was sent over to Ireland on 6 February, 1217; a summary of its more important provisions seems sufficient for our purposes. The original of the charter thus sent over has not survived and is known only from the copy in the 'Red Book of the Exchequer of Ireland,' a MS. Volume compiled in the 14th century. From this book Berry took the foregoing 'Magna Carta Hiberniae,' as it is there called. The Red Book has subsequently perished in the destruction of the Irish Record Office in 1922. At some time subsequent to 1216, the 'Magna Carta Hiberniae' was adapted to the King's Lordship of Ireland and to the case of his Anglo-Irish subjects, who were thus confirmed in the same liberties and rights as his English subjects. The differences are in those clauses in which 'Ireland' is substituted for 'England,' the Irish Church for the Church of England, the Liffey for the Thames and Medway, Dublin for London, and the standard measures of wine, corn cloth, etc., by 'the quarter of Dublin' instead of the quarter of London. 1. Many of the signatories had been members of Cambro-Norman invading families, and held lands in Ireland, since the invasion. They were undoubtedly familiar with Irish law, since they had administered there for almost 50 years. 2 In fact the Irish system had been preserved by the short-lived Treaty of Windsor, 1175, between Henry II and Rory O'Connor, negotiated by Laurence O'Toole. Even William Marshall's wife, Isabella, was the daughter of Strongbow and Aoife, Aoife being the daughter of Mor O'Toole and Dermott MacMurrough, both royal families of Leinster. She was also niece to Laurence. 3 The Irish legal system had fully matured by the eighth century, long before its Anglo counterpart. There was a unique (compared to Anglo and European systems) concept of national or federal law, applying to each person in each locality. While not embodied in a single document, these rights of individuals were beyond the kings power to legislate. Ironically, it was this 'lack of centralized power' on the part of the high king of Ireland that was blamed for the success of the Cambro-Norman Invasion in the first place.